A symposium on Philippine Film: History & Criticism will be held at the CMC Auditorium of UP-Diliman on January 13, 2012 at 8:30am to 5:00pm. This is in honor of Nicanor G. Tiongson. 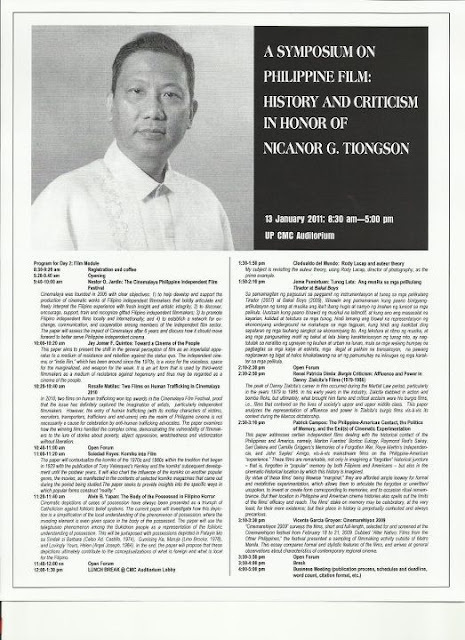 The paper will contextualize the komiks of the 1970s and 1980s within the tradition that began in 1929 with the publication of Tony Velasquez's Kenkoy and the komiks' subsequent development until the postwar years. It will also chart the influence of the komiks on another popular genre, the movies, as manifested in the contents of selected komiks magazines that came out during the period being studied.The paper seeks to provide insights into the specific ways in which popular forms construct "reality."